Patio covers and carports add to any yard. One of the great joys of living in a house is the outdoor space provided by things such as patios. However, the sad fact of the matter is that in most of our homes, the patio is underused. Snow and rain force us to remain indoors far too often, and even on nice days it is often just not worth the hassle of dealing with annoying bugs that ruin far too many barbecues. On many days the sun is too hot to endure the outdoors without the benefit of shade. The perfect solution to get you back onto your patio is a Patio Cover. Less expensive than installing a traditional sun room, a Patio Cover allows you to use your existing patio space far more efficiently. Now you can enjoy the beauty of your yard, even when it is raining or snowing. With a clear canopy Patio Cover, you can enjoy looking up at the stars at night while sitting comfortable and snugly in the comforts of your own comfy chair. During the day, high quality windows block you from the harmful UV radiation. Shelter your car or boat from rain, hail, snow, and blistering heat. Ballew’s carports are made from aluminum, custom cut to the size that fits your needs. Our carports have the handsome baked-on finish as well as the strength of aluminum to give you beauty, durability, and minimal maintenance cost. 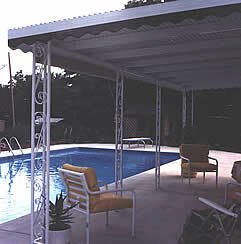 Ballew’s Aluminum patio covers are custom made to your specific needs and are made out of top quality aluminum products. Neat clean lines and color accented to enhance the beauty of your home. The perfect patio cover can now become a reality. Energy savings – Reduces summer temperatures in your home.